So you created an awesome private query and now you want to share it with another user. Since it’s a private query only the user id who created the query will have access to it. One way is to change the ps query from private to public. By making it public, everyone who has access to query viewer or query manager will be able to see and use the query . But what if you just want one or selected users to have access to your private query ? In this case, you can share a copy of your private query with another user(s). Here is how to do it. Go to Reporting Tools > Query > Query Manager and select the private query you want to share with other user. After you have selected your private query/queries that you want to copy to another users, simply click on the drop down button next to ‘Action’ field as shown below. 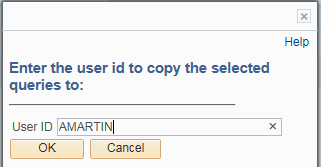 Select the option ‘Copy to User’ and Click ‘Go’. Next you will be asked to provide the user id of the target user with whom you want to share the copy of your private ps query . A copy of your private query will be shared with this user. Target user should be able to see the private query provided they have appropriate query security to access the records used in the query. After this step, both you and target user will have one copy each of your private query. Also once copied, both the users can make changes to their version of private query and changes will remain private to them only. For multiple users, simply repeat the above steps for each target user. In case you want to transfer private query to another user instead of creating a copy, see this post.